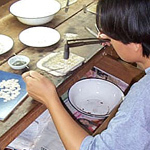 An exquisite pair of earrings by the hands of the Thai jewelry artisans. 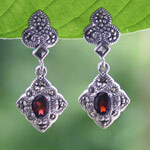 The artisans set faceted garnets on the silver surface and enhance the antique-looking design with marcasite. 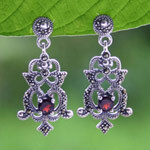 Materials: Sterling silver (.925), marcasite and garnet. 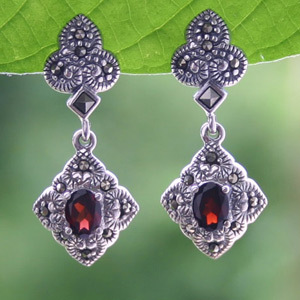 These marcasite and garnet dangle earrings are handmade by jewelry artisans in a workshop located in Bangkok, Thailand.